We are getting lots of yardwork/gardening done. So many pretty flowers — finally! 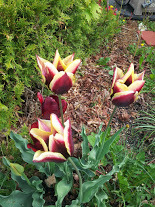 I really loved my tulips this year. I guess the snow was deep enough to keep the squirrels from eating my bulbs. 🙂 Sadly, the tulips are finished blooming for this year. I will miss them. Dare I say that I hope we have lots of snow again next winter to keep my bulbs all safe and cozy? Stop throwing things at me!! But, I’ve got lots of other flowers blooming to keep me smiling when I am outside. I have a couple of mums that are showing signs of life. I thought they were goners and almost pulled them out but I decided to wait a bit longer this year and then I saw those little leaves popping out! Glad I waited. I’ve got my petunias, marigolds, pansies, celosia all blooming nicely. The azaleas finally bloomed but not very profusely. The rhododendrum is showing a bit of pink buds. So much gardening to do to get the season started. Not enough time in my sewing room. I will be spending some time in there this weekend being creative and will share what the outcome is. Have a wonderful Memorial Weekend everyone.